In June, my company brought in Jon Gordon to speak with many of our leaders and top performers. He shared with us ideas from the many books he has written and some of his personal challenges and accomplishments. In this meeting he challenged us to find our purpose and our passion. He also challenged us to choose one word to help drive our behavior to living our purpose. Many people shared their words; drive, success, tenacity were among some of them. The word I chose was optimism. Not because it is a word that I am very good at or a role model for by any means. In fact, the opposite may be closer to the truth. I wanted to select a word that was missing from my personal inventory that if I really really really worked at being better at would make me better. Here is my favorite definition for optimism: the tendency to expect the best and see the best in all things. It’s the philosophy of: this is the best of all worlds, good triumphs over evil, and not only is the glass 1/2 full, it contains more than is necessary. It’s easy to understand why this is a desirable trait, but it’s not always so easy to do. A friend of mine has a quote he uses frequently; “what is easy to do is also easy not to do”. 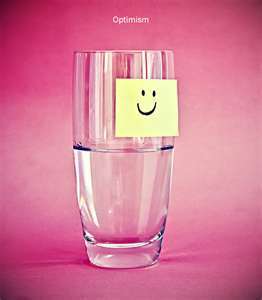 Reviewing my own personal tendencies I have found that I generally fall in the “not to do” when it comes to optimism. How about you? Do you always see the good in everything before you see the bad? How many times do you hear a new idea and your first thoughts are everything wrong with the idea? One step that has helped me be better at this is slowing down. Instead of jumping to conclusions I try to slow down and absorb what I am hearing. This has helped me at work when listening to the ideas of others and at home with my family (although they may think I have more work to do). One of HBR’s bloggers just posted a helpful article on the topic Learning Optimism. I enjoyed it and I hope you do too. What is your word for 2011?